The holiday season is fast approaching, your list of gifts goes on and this year you decided to offer original gifts made, by you, with love. You do not intend to spend your savings in various stores but rather it is in your kitchen that you want to produce thoses memorables gifts. Traditionally it is better to make preserves, jams and jellies in harvest season but it is also possible to achieve great result from frozen fruit. It is the secret that we offer you in this new publication. 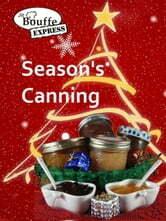 You'll find a list of 20 recipe ideas to offer canned Christmas gift that will delight your family and friends. We have included 13 JAM, 2 JELLIES, 2 MARMALADES, 1 SAUCE, and finally 2 SPREADS recipes. The Cheesecake Recipe Book - Cheesecake recipes to amaze your guests!